Dana Rohrabacher: Lying now or then? 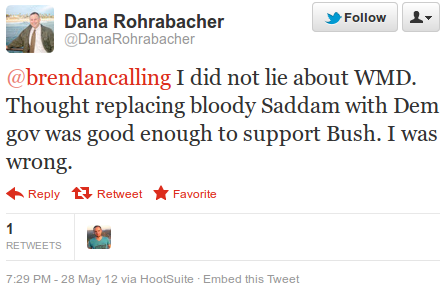 Back in 2002, California Republican Dana Rohrabacher was an outspoken advocate of invading Iraq, the sort that claimed it was improper to even label the impending invasion a “war” because it was really more of a liberation, one for which the Iraqi people would be so grateful they’d be “dancing in the streets waving American flags just as the people of Afghanistan still are grateful to us for freeing them.” When that gratitude predictably failed to materialize — it’s hard to really let loose and celebrate when you’re busy making funeral arrangements for family members liberated from their corporeal existence — Rohrabacher, rather than engage in any sort of self-reflection, labeled Iraqis ungrateful and famously demanded they foot the bill for the destruction of their country. We’re not declaring war on Iraq. We are declaring that Saddam Hussein must go. And Saddam Hussein must go for the sake of the people of Iraq and for the sake of the safety of our people. And let me note this, rebuilding Iraq will be much easier than building Afghanistan. Iraq has enormous resources that have been channeled away by Saddam Hussein to develop chemical and biological weapons and to develop nuclear weapons. Those billions of dollars can be put to use to build a better Iraq. And the people will applaud us for helping them with that end. No, this is much easier than the job in Afghanistan. Yet we have the naysayers among us who would lead us in the other direction. So the question is, congressman: Were you lying then or are you lying now? Translation: I don’t deny that I lied before Congress and the American public in a major floor speech on the eve of a decision to go to war. But other times I didn’t! This entry was posted in Congress, Iraq, Republicans, War Crimes. Bookmark the permalink. 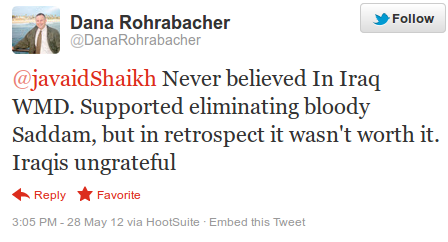 2 Responses to Dana Rohrabacher: Lying now or then? Lying now or then? It's Dana Rohrabacher . . . why choose one. It's almost certainly (looking at the record and his tweets) BOTH.